The actual factory. C The derived class (the actual plugin) B The base class interface for the plugin. Definition at line 181 of file meta_object.hpp. Definition at line 187 of file meta_object.hpp. The factory interface to generate an object. 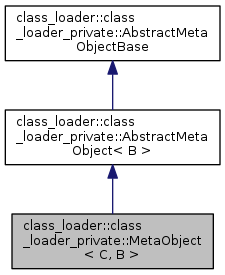 The object has type C in reality, though a pointer of the base class type is returned. Definition at line 196 of file meta_object.hpp.